Orochi is a philosophical horror manga series from Japan's master of the horror genre. Each chapter is a separate story that explores different aspects of humanity and the human condition. The main character, Orochi, is a mysterious woman with odd powers and a keen interest in understanding human nature. In her travels, she meets people that she is so fascinated by that she takes an interest in their lives, sometimes for the better and sometimes for the worse. Orochi was partially published in English as Orochi: Blood by VIZ Media, who released the first volume on September 5, 2002, before dropping the license. One of the first, and lesser known works from horror master Kazuo Umezu, Orochi consists of 9 tales linked between them by the eponymous narrator; Orochi, has the appearance of a beautiful girl and is a keen observer of humans she deems interesting. Sometimes she will even exit the shadows and intervene with the lives of those she observes, altering their fates using her array of supernatural powers. Unlike more famous Umezu works, like Hyouryuu Kyoushitsu (The Drifting Classroom) or Kami no Hidarite Akuma no Migite (Left Hand of God, Right Hand of the Devil ), horror; gore; and the supernatural, have to backpedal to a lesser role and allow the humans to take the spotlight; this is a series of dark secrets, revenge, and accumulated hate. With Orochi as our guide, we get to witness the corruption of our human hearts with little-to-no aid from the traditional supernatural scapegoats. There is a variety of themes explored and some stories will better suit your tastes than others. I found some of them lacking, especially compared to Blood -the last one. All the stories are pretty long for manga ones, averaging well into 100 pages, meaning that characters and plot are well developed. The psychological focus, may alienate some readers who were maybe expecting a more mainstream horror setting. I have to admit that sometimes I, myself hoped for a more sinister turn of events. The artwork is superb. Umezo puts to shame today's computer-aided mangaka. Each panel is masterfully drawn; the women are especially beautiful and the depth of the details of the backgrounds seems to draw the reader inside the story. 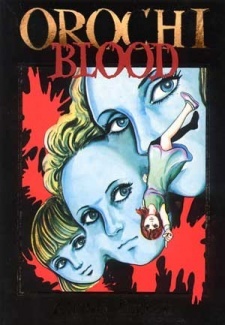 This is an important manga because it can be clearly seen how it influenced Ito Junji, arguably Umezo's successor and a horror master in his own right; we have the beautiful women, the existential dread, and the heavy panels. Although Ito always opts for the most sinister of turns, it is obvious that this manga was a big inspiration for him. Orochi is a good manga, although the quality of the stories is uneven. If you find Blood at some bookstore's shelves do not hesitate, the great story and even greater artwork will make it a great buy. 7.5/10.